Health chiefs got an early Christmas present when construction of Southport’s new £20 million mental health hospital got underway with a ceremony to mark ground breaking on the site. Mersey Care NHS Foundation Trust Chairman Beatrice Fraenkel and Chief Executive Joe Rafferty were joined by construction partners and guests for the sod-cutting to commemorate the official start of building and ground works. 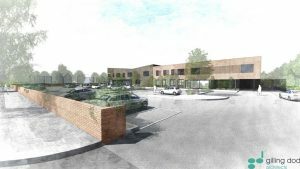 The hospital will combine local mental health inpatient care and some related community services on one site, with its own parking and close to a main route well served by buses. All 44 bedrooms will all be single with en-suite bathrooms and patients will have access to inner garden courtyards, therapy and activity areas. There will be an on-site café for patients, visitors and staff, a family visiting room and sacred space, suite of offices and outpatient services. The construction team are now working closely with Sefton Council to ensure safe access arrangements are put in place before heavy site equipment is moved on site.